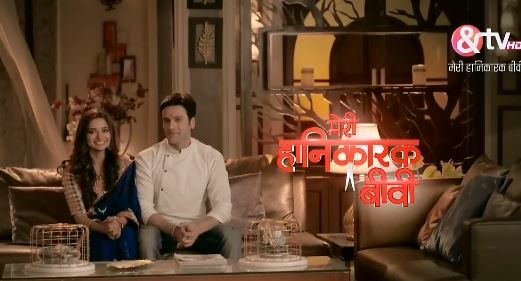 The Episode starts with Mishri asking where is Ira. Ira sees Birju’s pic and takes his blessings. Pushpa asks Kunika to get Birju’s blessings, then they can exchange rings. She sends Akhilesh. Ira thinks he is coming this way and hides. Kunika steps on marbles and falls down. Mishri smiles. Everyone rushes to Kunika. Pushpa asks how did she fall. Pushpa asks how did marbles come here. Mishri thinks Kunika has laid the trap for other and fell in it. Akhilesh helps Kunika. Doctor checks Kunika and says she has a fracture in her finger. Pushpa says she had to wear engagement ring in that finger. Doctor asks her to postpone engagement, the finger needs a plaster, not ring. Mishri is happy. Akhilesh takes Kunika. Mishri happily dances. Ira sees her and thinks to take her class. Chandu goes. Bhavik asks why is she dancing. Vansh says she dances on old songs when she is happy. Ira goes and calls Bhavik. She asks him to come out and meet. He says I have good news, Akhilesh and Kunika’s engagement didn’t happen. She says I know, tell me what is Mishri doing here. He says relax, I m doing this for good. She says it will be a disaster if anyone knows this, Mishri is Akhilesh and my daughter. He gets shocked. She tells him everything. She cries and says I don’t want to lose Mishri. He says don’t take tension, its my mistake to get Mishri here, I will get Mishri back to you, go out and wait for me. Doctor says Kunika needs a month to recover. Pushpa says it means engagement can’t happen for a month. Mishri says Lord does everything for good. Devina scolds her. Akhilesh asks who are you, give me number of your parents. Bhavik comes and says no need to call his mom, I have come to take him, his mom is my colleague in my hospital. Pushpa says Akhilesh got saved because of Monu, go and give sweets to his mom. Akhilesh agrees. Bhavik says I will give sweets, Akhilesh should be with Kunika. Pushpa asks why, did Monu save you. Bhavik thinks nobody should know that Mishri is Akhilesh and Ira’s daughter. He asks what, your flight got cancelled, fine I will take care of Monu. He lies to them. Pushpa says Monu will stay with us. Mishri asks why do you want to take me from here, I feel this is my family, I will get Ira married to Akhilesh. Bhavik asks her to forget it. He sends her to Vansh’s room. He calls Ira and thinks to inform her that Pushpa has stopped Mishri at home. Guard calls him out. Ira waits for him. Akhilesh scolds the guards. He says I want to see CCTV footage. Bhavik thinks Akhilesh will learn Mishri’s truth. Bhavik stops Akhilesh from seeing the footage. Ira calls him. Akhilesh sees the call.